In medium bowl, mix beef, bread crumbs, onion, salt, pepper, allspice, nutmeg, milk and egg. 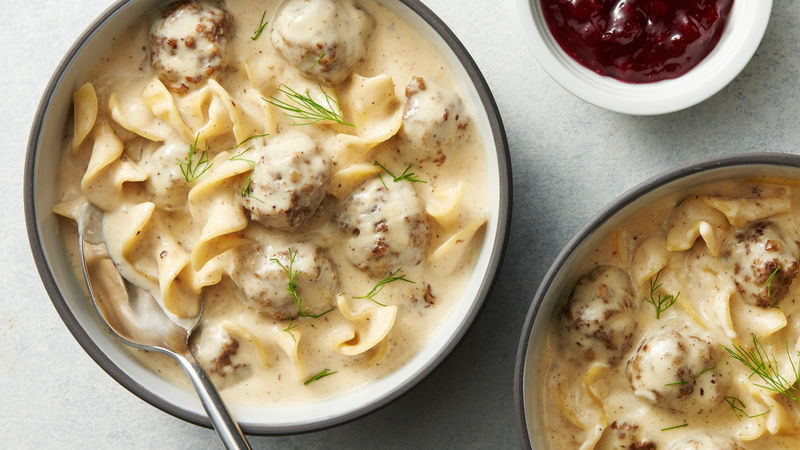 Shape into about 60 (1-inch) meatballs. In 5-quart Dutch oven, melt butter over medium-high heat. Add half of the meatballs; cook 3 to 5 minutes, gently stirring occasionally, until browned. Use slotted spoon to remove meatballs. Repeat with other half of meatballs. Reduce heat to medium; add flour to Dutch oven. Cook 1 minute, stirring occasionally. Add broth and whipping cream; beat with whisk until smooth. Heat to boiling. Add meatballs and noodles; cook 8 to 10 minutes, stirring occasionally, until meatballs are cooked through and noodles are tender. Divide among 6 serving bowls. Garnish with lingonberry preserves and dill weed. For added richness, try serving this Scandinavian soup garnished with a dollop of sour cream.